New cabinets are going to run a fortune... save your money and spruce up the kitchen with some sewing! These projects are great inexpensive ways to add color, charm and fun.. even when the kitchen is outside at the barbecue! 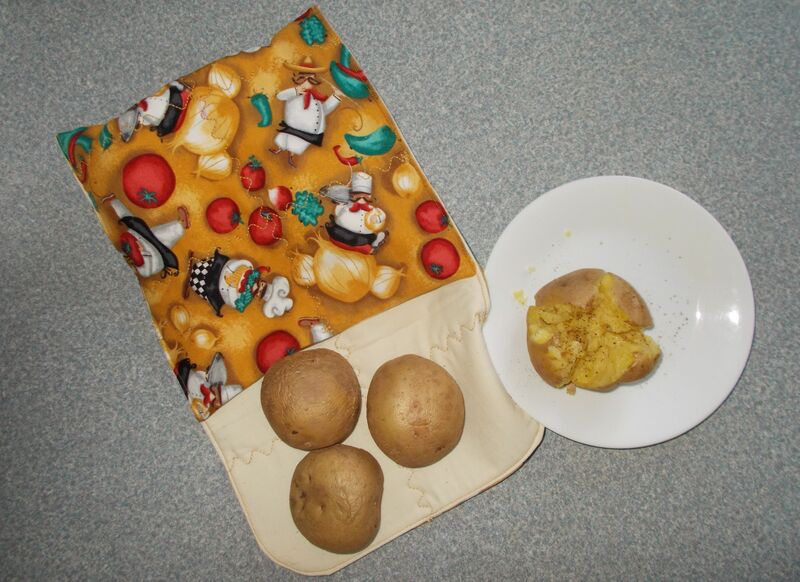 This potholder mitt can be used as a regular potholder but also has the option of keeping your hand safe from heat by using it as an oven mitt. Never worry about removing that hot bowl from the microwave again with a pile of this style pot holder at hand. Make a stack for your family and another stack for all of your friends! There's nothing quite like hot apple pie ala mode... and this style pot holder will help keep the pie hot as well as make it safe to transport so everyone can enjoy that hot fresh pie! From super simple to sew, great learning project potholders, to more elaborate that serve multiple purposes, you'll find many free patterns to se various style potholders on this page. Apron styles can vary as much as garment styles. This page will give you choices to pick your apron style. Add trim and ruffles to have an apron for every occasion... or gift giving need. The instructions are for an 8" X 8" dish with full details on how to make the dish any size. A great house warming or hostess gift with a nice warm casserole. Are you looking for a quick project to spiff up a kitchen or a small house warming gift? Here's one that can be made to match any decor! Use scraps from your kitchen curtains or small appliance covers to tie everything together. The included pattern piece includes the hemline for the newer short dish liquid bottles. Always have a hand towel hanging and ready to use by adding these tops to a towel. Designer appliance covers can cost a small fortune and it is difficult to find ones to match your decor. Find the perfect fabric for your kitchen and make them be just what you want! A simple project to dress up a homemade gift. Add a buttonhole to the center of the cover for a usable coin bank when the goodies have been eaten. Having a place to put those plastic shopping bags makes it much more likely that they will be reused or recycled. Make a caddy to match your kitchen with these free directions. When you clean up from a picnic or party do you find dozens of half-empty cans? This quick project will help guests identify their can... and hopefully finish their can before getting another. This apron makes a great gift and can be made in any fabric for a fun theme. Make a chef hat to match for the BBQ chef in your family. A great gift for someone starting cooking school or to complement a BBQ apron. Do your part to save the environment by not using those plastic shopping bags. Sew your own bags that are more durable and won't rip carrying in the groceries. Lunch boxes seem to become "uncool" at an earlier grade level every year! A new brown bag in the trash for every school day really adds to our landfill nightmare! Contribute to ecological efforts by making an insulated fabric sack that will keep your or your child's lunch cold and safe. Large bottles of soda are less expensive at parties and picnics, but keeping them cold can be a challenge. Expand your party theme and keep the drinks cold by making insulated covers for the bottles. Bring your own beverage to parades and community events and keep them cold. Here you'll find insulated bottle totes in various sizes for most popular water and soda bottles. Here is a way to keep that drink cold! Sew bottle gift bags for easy wrapping and an impact on the environment.